The unions of fishermen of the Far East opposed the crab auctions. His disagreement with the position of the government Dmitry Medvedev said the Kamchatka, Primorye, Sakhalin. Fishermen insist that the rejection of the historical principle would destroy the industry, left without work of thousands of fishermen, — the correspondent of IA REGNUM. 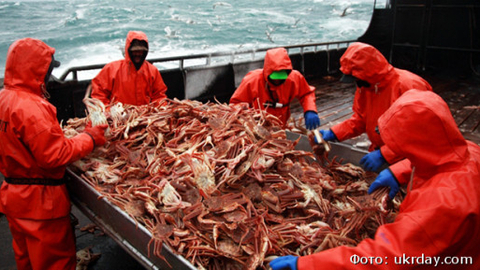 The Union of fishermen of Primorski Krai has sent to the state Duma appeals, which disagreed with the bill on crab auctions. Primorye supported their colleagues from Sakhalin. Kamchatka regional Parliament spoke out strongly against the introduction of auctions. In addition to the state Duma of the Russian Federation, the appeal sent to the Federation Council, the RF Ministry of agriculture. Trade Union members stressed that the bill, signed by Dmitry Medvedev and has already been sent to the state Duma, according to which 50% of quotas on vylov a crab will be put up for auction will be a fatal blow to the entire industry will be left without work, thousands of fishermen will be deprived of revenues of regional budgets of coastal subjects of the FEFD. In the appeals also noted that the bill the government were prepared in secrecy, without discussion with the fishing community, without public examination. The unions are asking the deputies of the state Duma of the Russian Federation after discussion by the Council of the state Duma to send the bill to the regional government with a review period of not less than 30 days. As reported IA REGNUM, the fishermen of the Far East were outraged at the unprecedented "crackdown" on the industry in the air of the Central TV channels of the country. In the so-called investigation of the whole industry was presented as a criminal formation. Federal industrial fishing FishNews portal sent a request to FSB with the request to comment on the allegations of the TV "investigative journalism", which actually accused the fishermen not only of corruption but also of the power and Supervisory structure, including the Border service of the Russian Federation, that they are close to these outrages the eye. From the FSB came the answer, in which it was reported that the secret service does not have similar facts. Fishermen in the Far East held a protest against the introduction of auctions and the denigration of the industry. In all seas and ports of the world, where the court was buzzing siren marine, for an hour stopped working. But before fishermen no one apologized, Prime Minister Medvedev signed a bill, written without discussion with the fishermen. On the eve of the economic development Ministry sent the draft law a negative review, noting that the developers have not carried out a detailed analysis of the impact that the adoption of the law should expect defaults and bankruptcies of small and medium fishing companies.